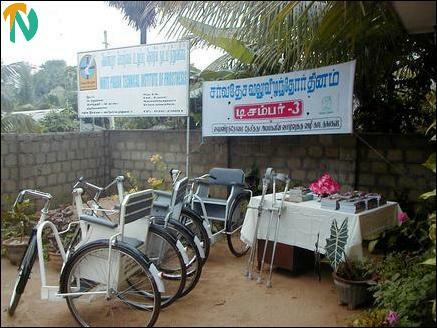 The Co-ordinator of the Trincomalee White Pigeon Technical Institute of Prosthesis, Mr. M.J.Wilfred, handed over tricycles, clutches and wheel chairs to the needy. Learning tools had also been handed over to the disabled students in the area. Mr. Wilfred said that his organization had already helped Trincomalee disabled with ten tricycles, five wheel chairs and nine clutches. At the Friday’s event three tricycles, and three clutches were handed over to the disabled. Ten disabled students were also given learning equipments such as exercise books, pencils and other items, he said. Tricycles, clutches and educational tools are displayed at the event. Mr. Wilfred said his organization has been collecting details of the disabled in the district. Upto now his organization has collected information about seven hundred disabled persons in the district. Of them only forty had submitted their needs. He appealed to those disabled to submit their needs without delay as step has been taken to open a factory in Trincomalee to manufacture artificial limbs. Mr. Wilfred said already selected personnel have been given training in Killinochchi White Pigeon Technical Institute of Prosthesis. Once the training is completed one of them will be posted to Trincomalee. 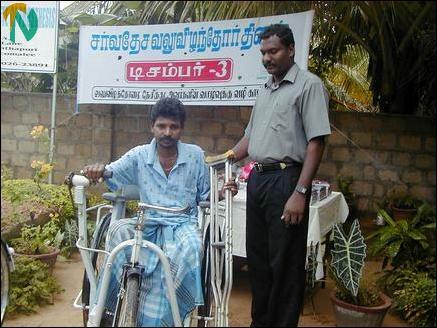 Mr.Wilfred hands over a tricycle to a disabled person. The Trincomalee White Pigeon Technical Institute of Prosthesis was started on 28th April 2003 and now a committee with Dr.S.Abraham, Deputy Provincial Director of Health Services as the President, is managing it. The office bearers of the committee are: Vice President Siva Sri Kanaka Nithiyananda Kurukkal Secretary: Mr.M.Sivakumar, Treasurer:- S.Rajkumar Committee: - Dr (Ms) P.K.Gnanagunalan, Dr.B.Sasitharan, Reverend Brother S.Terrence, Mr.K.Thilakaretnam, and Mr.A. 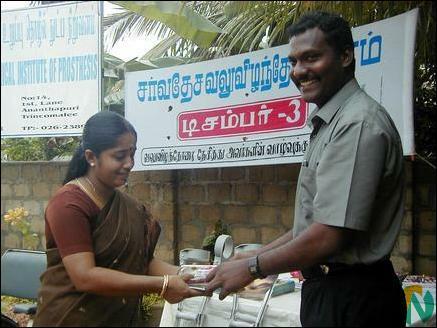 Parasuraman, Mr.K.Sivapalan and Mr.V.Vasantharajah. Trincomalee White Pigeon Co-ordinator Mr.Wilfred hands over educational tools to a teacher to be distributed to disabled students.